This car shows how to park safely in the city, even if you don't have your own private parking area. By parking inside of the lamppost, the vehicle owner knows that they have no worries about being clipped by passing cars, lorries or buses. Their one remaining concern is people cycling or walking along the pavement. If laws against cycling on the pavement were properly enforced, they would have much less to worry about. Copenhagen Chic brightens everyone's lives with pictures of beautiful Danish women on bicycles. 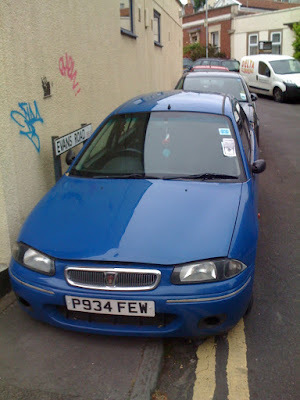 We are trying to compete with photographs of Bristol women parking their cars in ASL zones, such as this car, P996RHU While not actually riding bicycles, they are in the bike-only parts of the junction, which makes it a close second-best. What's that on the far right of this picture? Bike parking? More bike parking? By allowing bicycles to park on the pavement, valuable space is being removed, which would otherwise be used by cars. We are fortunate that this new bit of sidewalk-nibbling (a US term) has not taken place near the bike lane, as if it did it would remove valuable parking space from cars such as X847CFT. The trouble with big cars is that they don't fit into small spaces. Hence our posts about Demi-Drives. We don't really have big cars in the UK, though, because our roads are too small. This car (WV03UVM), however, appears to be sensing it's too large for its space. It knows the yellow paint may bite it one day. Its front wheels are making every attempt to get close to the building. And quite rightly - there's no pavement here, after all, and the road is a bit narrow (hardly a major thoroughfare though). 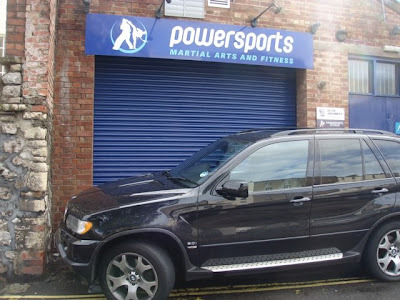 In fact, judging by the sign above it, it's probably here for a work-out. 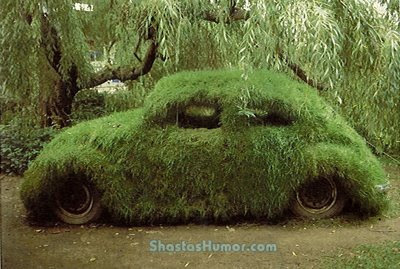 With a bit of effort it could end-up as a Smart Car. And if that fails, it may at least achieve a Yellow-Belt in parking ticket collecting. People who work at the car body repair shop whose sign takes up half the pavement outside it. People who work at B&Q. People who shop at B&Q. There are also all the people who park their cars along this road -up on the pavement during a weekday, which implies they may be residents or some form of commuter. There is one other group who may want to go to Muller Road -teenagers who want to take advantage of the sporting facilities on offer in the school playing fields. Henceforth anyone who wanted to come out here to play football or basketball after school, on weekends or in the school holidays, is no longer going to be able to. They will have to stay at home at watch television instead. This will improve child safety, as there will be less children on the street. This is a valuable improvement to child safety rolled out just in time for this summer holiday. We congratulate the school of their foresight and their priorities. There's a Guardian blog entry whining that the Bristol rent-a-bike scheme is doomed, as the insightful journalist has come out from London to discover that the city is in fact hilly. Yes. That's one reason the city is more fun than London, the other being Bath Ales and Butcombe Brewery, on offer at pubs at the top, bottom and middle of those hills. A pub crawl up St Michael's Hill would not be the same if the road was flat. It does make it harder to cycle round, but that is where people have a plan. Bath Buildings, weekday evening. No cars in the ASL, yet rather than wait patiently, this woman decides to run Gloucester Road -2 lanes of car traffic, one bus-lane on the right of this picture, and cars on the left waiting to turn into Bath Buildings. She lives, and was passed about 20 seconds later, her pushing her bike up Nugent Hill, before she'd even got past the one-way cars-can-contraflow stretch. If she were fit, she could have waited, cycled across on green, and got up the hill without having to risk the passing cars, faster. But think about it. By running the lights, then walking up the hill, she gets to get up the hill fairly quickly, without needing to be fit. Just brave. And for that, we honour her! The Royal Fort Gatehouse, Bristol University. This is where some Prince surrendered Bristol in the civil war in 1645. This gatehouse is all that remains -the castle-like building behind is actually early C20, and where the physicists hang out. This is a nice way to the (secret) park here, cobbled and with a bollard to keep cars out. But what does the sign from the other direction say? It says "Mathematics Accessible Entrance"
We are still trying to parse the sign. 1. This archway is more accessible to getting bits of maths in and out the university, on account of its parallel sides and arch on top, it is a mathematically correct entrance. 2. The university is doing some work on "Accessible Mathematics", as opposed to the complicated stuff like imaginary numbers and partial differential equations. • POP.Parks must fold into a box, reusable bag or tote that one person can carry while walking or riding public transportation. • Buidling materials that have little impact on the environment are encouraged. • When assembled, POP.Parks should be no larger than 8'x15' - the size of a parking spot. • Materials can be found or purchased, but must not exceed $20 in cost. "While the City is reclaiming acres of asphalt on Broadway, we're calling on New Yorkers to look out their front doors to their own streets," says Paul Steely White, Executive Director of Transportation Alternatives. "And just like the lawn chairs in Times Square, POP.Park will show that even on a shoestring budget, we can turn parking space into public space." Park(ing) Day NYC is sponsored by Transportation Alternatives and the Open Planning Project in conjunction with businesses, architectural firms and civic groups from all five boroughs. Streets and sidewalks comprise 80% of New York City's public space. More than 50 parking spaces will be reclaimed for this year's Park(ing) Day NYC. The international event began in San Francisco in 2006, and has since expanded to dozens of cities across the country. Full details about Park(ing) Day NYC, including a map of all spaces and activities, are available at parkingdaynyc.org. And so to the Portsmouth seafront, centrepiece of a cycling town. Here we see it on a sunny Sunday in May, full of pedestrians. These two-wheeled terrorists are scaring the pedestrians as they pedal past at 6 to 10 mph. There had been some proposals to open this path up to cycling; in a survey, 3000 people voted for this, while only 1000 said no. But that survey was an abuse of democracy, as pro-bicyclist pressure groups round the country clearly manipulated the vote, as it came out so strongly in favour of allowing bicycles on this path. Fortunately, the leader of the (LibDem) council stood up for the pedestrians, and overturned the proposal to provide a safe cycling route along the Portsmouth Seafront. It would have brought the wrong kind of people to the city. Now the same council is left with a problem. As part of their Cycle-Town funding, they promised a bike route here. Either they give back the money, or they come up with a different solution. We propose putting up a no bicycle sign on all routes into the city, making it a no-cycling-city. This will reduce conflict on roads and pavements. Act now to stop the Living Streets subversives! Steve Meek, lead subversive of the local Living Streets branch is at it again. First, he has finally achieved his goal of getting a parking bollard put in in Picton Square, removing the Range-Rover parking facility from Montpelier, forcing vehicles to park out in the street instead, and making it hard for lorries to do three point turns in the area. As you can see, the bollard is already tilted, but apparently it is more robust than its predecessor. Please submit photographs of any vehicles with matching bollard-shaped dents to bristol.traffic at gmail dot com. You'd think that would be enough, taking away one or two parking spaces from Montpelier would be enough, and killing the Multi-Modal interchange but no. He wants more. 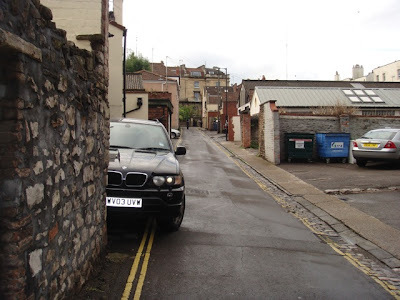 He wants to make our entire city "safe to walk around", which is really subversive-speak for "hard to drive around and with no parking"
Living Streets Bristol Open Meeting, Upstairs Room at Pizza Express, Corn St. 7.30pm, Thursday 23rd July. Secondly, If you cannot make it but want your views included, please tell us by email what you see as the priorities. Thanks to those who have already done so. Shortly after the meeting there will be a press release spelling out our vision of a walking - friendly city (want to help?). To be as representative as possible, we need your views. * A citywide crackdown on pavement obstruction by vehicles and bins. * More traffic free roads - the city centre on sundays as per Peter Abraham's suggestion, then ultimately every day for many roads. Living Streets is the national charity working to create safe, attractive and enjoyable streets around the UK, that is, they are explicitly anti-car. We think it is critical that everyone infiltrates this meeting to divert it from these goals. For anyone planning to do this, the closest parking to Corn Street is probably Trenchard Street or Queen's Square. Cabot Circus has dropped its parking fees recently, and it is 4x4 friendly (high ceilings), but you have a distance to walk, and that's dangerous. Those subversives are at it again, complaining that the government, by not letting NHS or MOD staff get tax-relief on bicycles is not helping cycling. So what? When the government gives someone a thousand pound rebate when buying a new car if you hand in an old one, you are creating a new revenue stream: someone who pays VED and fuel taxes. That money comes back. But a tax return for bicycles? What is the ROI? Closer to home, we do have evidence that the big MOD facility is very pro bike. First, a big sign promising new cycle routing. Second, the right of every driver -to park where you want -has been suspended. A sign warns you that unattended vehicles will trigger security alerts, and even vehicles with drivers in them get limited to 10 minutes -no-returns. This is stricter than at Bristol Airport. For all four MOD cyclists there is something that all eight UWE cycle commuters can only dream of. Secure bicycle parking. A fence, two CCTV cameras, with the one on the right backed up by IR sensors. And security guards, all to look after those two sheffield stands. There is even a bike path all the way into -and we do mean into- the entrance gate of this parking area. All is well here, no changes needed. Move along now. The previous post today makes a valid point. I have some video footage that I'll share one day. It has, though, reminded me about the consultation for Sussex Place (or St Agnes Gateway - as the Highways Department call it). Here you can take a look at the recent 'improvements' to this junction. The plan clearly sets out the key changes to the roads. 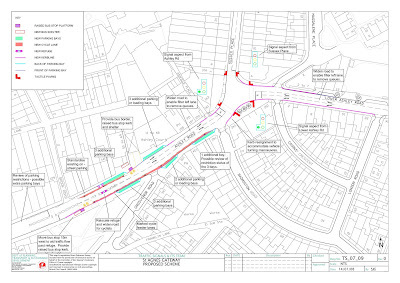 It shows where pavements are to be narrowed, and bus stops moved etc. What it doesn't show is the removal of existing cycle lanes. Lower Ashley Road used to have one. So, I think, did Ashley Road on the approach to Sussex Place. Because they weren't shown as being removed on the plan I didn't object to their removal. Which I regret every time I cycle this route and have to sit behind the cars and lorries (I don't do pavements, no matter what the Evening Post may say). Cunning stunt by the Highways Department of the Cycling City. Some truly advanced stopping by this white van shows how to beat pesky cyclists at the Sussex Place/Lower Ashley road junction. T735KDA claims its rightful space at the head of the queue, whilst barely infringing on the dedicated cycle stopping zone. Providing a dedicated safe area for bicycles to wait behind other traffic reduces the risk of accidents and keeps our city safe. Evans Road is just off the natural route for Policemen and Policewomen and even PCSOs returning to Redland Police Station. Which makes it a bit of a target for a parking ticket if you choose to occupy a convenient bit of pavement to leave your car (by driving on it). After all, driving on a pavement is illegal, so the Police can reasonably be expected to bring you to book if you do it. Here's a photo of an offender suitably chastised by our Boys in Blue (this is no "BCC Parking Services" ticket). But, why the favouritism? Why is only one of three vehicles penalised for committing the same offence? Could it be back-handers or Masonic influence or is it something even more sinister? Ah! Sorted. It's that evil yellow paint again. Which stops just under this vehicle: P934FEW. So, no underhand corruption or nepotism here, then. Just good old-fashioned law enforcement. They are stealing our parking places! Just off St Michael's Hill, May time. All is well, and a car FP05KKY is happily parked where its wing mirrors are safe. The bollards on the pavement protect the wall from anyone parking too close. And now look at it today. No parking space! It's been stolen by bicycle parking! This is a Sunday lunchtime. These aren't commuters. They are either residents -probably students- or have nipped in to the White Bear to have a beer or two. Either way, the cycling city campaign is taking pavement space away from us car drivers and given it to students or drunk cyclists. This is unacceptable. This site is sponsored by the Farm Pub (they let us buy their beer) and the Thali Cafe chain of Bristol, here seen in Totterdown; they have other sites in Montpelier and Easton, and will let us eat in or take away their lovely food. We are pleased, therefore, to be the first news outlet in the city to announce that the fourth village in the city, Clifton, will soon be getting a branch too. Presumably because it is so hard to drive across Gloucester Road into Montpelier, and it takes too long to walk from Clifton. Whatever the reason, we welcome a reason to go to Clifton! Could be a speed camera, van, perhaps? On the lampost to the right of the picture is the forlorn looking incident-witnesses-wanted sign from May's Mercedes hit-and-run collision with a bike heading in the same direction as the police van is pointing. The authorities are apparently still looking for the blue Mercedes. 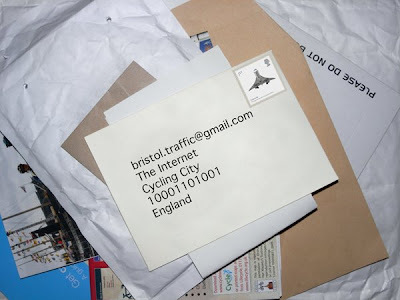 The Bristol Traffic mail room has been flooded recently with an unprecendented amount of letters, postcards and telegrams from readers in response to a recent post, with most correspondance expressing how underwhelmed readers were with the synchronised van display. One reader writes in to say that not only did she find it unimpressive, but she also feels she can do better! "What's so special about parking up the pavement? I do it every day! So does everyone! I don't see why those vans should get to have their photos on your website. How do I get a photo of my skills on your website? I've enclosed a couple in case you can show them. I think they're rather special and as you can see from the windscreen so do the authorities in charge of the awards. Not only have I got all the way up the pavement but I've done it in an area that will gain maximum attention from pushchair users. Hope you can show off my talents too, Shirley Parker RK06 TZG"
Well Shirley, although your skills are obviously impressive enough for an award, we have to say that your display is still not on a par with the vans. One area you are lacking in is stamina. While you managed to hold your position until just before teatime, the vans held strong for almost a whole week without flinching once. We do feel that your attempts deserve recognition though for good effort. We noticed too that you have used the often favoured pavement outside Playspace on Barrow Road in St Philips. We know that if your display was being judged by our panel then points would definitely be deducted for lack of originality. Although it has to be said, displays of pavement parking are become a rarer occurence here after partons of Playspace expressed a dislike of the parking methods, details of which were passed on to the management, who have obviously launched quite an effective awareness campaign to stop people parking in such a manner, as can be seen in the photo below. A radical difference I'm sure you'll agree. Although driver WN56FTO didn't agree pointing out that unloading her child into a pushchair to get from the car to the building she was greatly inconvenienced by the extremely inconsiderate parking of driver WM06JFX which stopped her being able to get her pushchair and child along the pavement and they had to go around on the road to get past. We'd like to offer a solution and show an example of the parking configuration the following day. Although it looks remarkably similar the configuration of cars in the above photo is actually subtly different from the previous day. Whereas the cars were previousley arranged with one at the front and two at the back, they are now the opposite way around. Having WR53 ZVN and WF53YWN arranged next to each other at the back means that R869 DTG at the front has clear access to the entrance without having to risk the road and everyone is happy. Subtle yes, but it's amazing what a difference a small change and a bit of common sense can make. Of course there is also the option of parking over the road on the other side, and while it will involve crossing the road it's a danger and sacrifice that some people are willing to make, because they're selfless and kind like that. Driver YG58HXX has not only parked over the road but also a few yards down the road meaning they'll have to endure some serious walking to get to their destination too. But that's ok becuase if it means putting other peoples safety and convenience first then they're all for it. Not only are they going out of their way for others, they are also letting unobservant cyclists know that the dedicated cycle path that passes under Barrow Road helping cyclists avoid having to cross over the Barrow Road / St Philips Causeway crossroads, has well and truly come to an end at this point. So it's not all just about winning, it's also about due consideration for those around you as exemplified by YG58HXX. After all life's not a race. It's not about reaching the finish line the quickest, but enjoying the scenery on the way. As the famous saying goes, If you don't stop to smell the flowers once in a while, you'll probably spend less time standing on the pavement next to them and statistically be less likley to be in the way of someone who needs to park on it. Has anybody seen the Banksy vs Bristol Museum exhibition? Graffiti is wrong. We all know that. But the exhibition is, in fact, not a series of witty or political statements of a 'Bristol lad made good'. Nor a comment on society as it stands in our green and pleasant land. Or even a celebration of Bristol City Council's ability to not know that a major crowd-puller was being installed under their noses. On their premises. No. In true Banksy fashion, it was just a ploy by the 'artist' himself to inconvenience Bristol's drivers. Now that the leader of Portsmouth council has managed to stop bicycles from endangering themselves and pedestrians, how can they get along the seafront? Ideally, they wouldn't be allowed to. But if they must, there is all we need already there. There is a road along the seafront, right behind all these echelon-parked vehicles. Yes, the risk of a car reversing into you is high -but stop whinging, at least nobody will open a door into you, so you can cycle in the far left of the car lane, letting tax-paying cars past without inconveniencing us. Further along, at Eastney, there is more bike lane. Here we can see it under the car V40NFR, while some pre-teen subversives-in-waiting cycle down the pavement defiantly. Apparently the beach police do stop and fine cyclists for violating the bye laws, but sadly there are none about on this Sunday morning. No doubt the cycling activists will come back with some proposal, like move from echelon to parallel parking. This is wrong and must be opposed. It is not just that this will drastically reduce the amount of available parking , leading to an equivalent collapse in council revenues (year round parking fees, something like £8/day), being able to park facing the water is an inalienable right of the British. Other countries have warm beaches, attractive people with fit bodies in skimpy swimwear sunbathing on them. We in Britain have a cold wind blowing rain over pebbles, with the car being the only place to sit and enjoy the view. Even on the day these photos were taken, one of the hottest May days in Portsmouth for years, the cars are full of people sitting in their cars. The only concession to the blistering heat is to let down the windows. Driving to the beach and sitting in your car is a lifestyle choice. But it is more than that -it is the British lifestyle. If you can't face the water it doesn't work. If your view of the sea is interrupted by happy cyclists it doesn't work. All attempts to put bike lanes in on the road, or to allow bikes along the seafront pavement are attempts by the EU to undermine what Britain stands for. They are trying to make us pedal round our cities like Dutch or Danish people, buying healthy fruit by the kilogram and paying for it in Euros. It is all part of the same continental conspiracy. Here on the Southsea seafront, we can see in the background the D-Day monument, a memorial to all the people who left from this harbour and died on the continent purely to preserve our way of life. We cannot let these bicycle-pedalling EU-officials take it away from us. This is Gunwarf Quay, Portsmouth, their shiny new shopping centre -an equivalent to Cabot Circus, albeit one with more outlets. What is this seen by the harbour? An area which could have been used for premium bar tables dedicated to bicycle parking? And its used too. Something about a highly-visible place to park your tax-dodging toy vehicle encourages people to cycle there and park their bicycles. There is even a sign telling the owners to lock their bikes up. It clearly encourages people to come to the area by bicycle. If these people were going to come by car -and there was space in the car park, then it has lost income from the car park, and for the UK government in fuel. If these tax-dodging criminals were going to shop, they are now limited in what they can buy. This may reduce income to the shops. They will get in the way of premium spending car driving customers on the roads. It frees up space in the (small) car park, which only has 1500 spaces. If you can fill that up with shoppers and still get people to come by bike, you earn more. If the people come by bicycle they may be thirsty and hungry, so spend more in the bars and restaurants. Provided you are selling high-margin products that fit in carrier bags on handles, you can still sell goods. Fuel VAT and Tax loses don't show up in the balance sheet of the shopping centre, and that money may instead be spent on products within your facility. If you have space in your car park, and people choose to cycle instead of drive, you are losing money -unless they spend the money saved in fuel and parking in your shops. That is, it only makes sense to dedicate space to bicycles if it brings in extra customers, rather than diverts customers who would otherwise pay the hour to park. As Cabot Circus has 2500 spaces, it fills up less often, so there is less benefit in providing cycle parking. Of course, the other factor in the equation is the revenue-per-bicycle. If bicycle parking encourages poor people to visit, then unless you get lots of them, each spending a small amount, you don't gain much. Same for pedestrians. This multi-pedaller bike system gets its forward movement from the work of the two at the front -the one at the back is only driving the sound system. While he eats off a plate. Which is where it gets interesting. Imagine a fleet of these, picking up people from the city centre on a Friday or Saturday night. There's enough power in those front two legs to get over the hills, while the passenger in the back not only gets the option of music -if they choose to pedeal- they are in the idea position to eat a kebab and chips on the way home. Even better, being in the open air -no smoking restrictions! It's a well known fact that one of the main concerns facing people who are considering taking up cycling is a lack of clear understanding of what cycling actually involves. We all know that it's some sort of old fashioned hobby involving two wheels, one often bigger than the other and protective clothing such as the "top hat", but beyond that it's difficult to know where to look to find more informaton. Simple quandries such as "where am I meant to cycle" are often raised by potential newbies and seasoned pros alike. So in an effort to address some of these issues we'd like to provide the first in a short series of guides to cycling in Bristol. First up, that very quandry, where should you cycle? As we all know cyclists don't really have a right to use most roads as they don't pay road tax, so often ample provision is made to keep them off the streets. These provisions are often subsidised through proper road users road tax in an initiative known as Carbon Upsetting. The facilities that these funds provide are often easily recognised by the bike shaped markings on the ground such as the one pictured below for the underpass linking Jacob Street to Broad Plain. It should be noted if you're new to cycling that this is an especially useful route to know as it links the centre of Bristol with the world famous Railway path. Useful not only for fun (if you've ever been Spelunking you'll know that the excitement of navigating an underpass comes a close second to some of the best, darkest caves in the world) but also for that essential commute to and from your city job. The bike symbol markings on the ground on the left, along with the line down the middle of the route, provide important information indicating that if cycling you should keep to the left, much as a car would on the road. So it's a safe bet if you're in any doubt on any shared path, keeping to the left should be the correct thing to do. Just as the rules of the road have a language and continuity to them, so does the rules of the cycle lane / shared use pavement. Important to remember however that if you're travelling the other way then you should keep to the right. Sounds confusing? It's really not. I like to remember it using the catchy phrase "keep to the left and you'll be in the right, but sometimes keep right and make sure there's space left on the left". Armed with this knowledge you should always know where you can cycle on shared use pavements and cycle paths. Shared use pavements are, as their name suggests, for the use of both cyclists and pedestrians. Pedestrians are always more than happy to share the pavement with bike riders as they are always aware of the shared use status due to frequent use of bold blue signs indicating this, such as this one pictured at the end of Leander Way in St Philips. Note the symbols of both bikes and people. This is because the upcoming pavement is for use by both bikes and people, an amazingly innovative system praised by pedestrians and cyclists alike. Shared use pavements also have a lot in common with contraflows in that they will both be clearly marked with bike shaped symbols on the ground. Contraflows are a last resort measure used when no other off road facilities are possible and are one of the rare exceptions to the rule where cyclists have some rights to use a bit of the road. The other exception is use of "parking lanes", sometimes to referred to as "cycle lanes" which bikes are allowed to use when there is insufficient room on the pavement and no vehicles need the space for parking. Sometimes contraflows can also be parking lanes but there is generally no hard a fast rules about this with status changing from day to day. It's usually left to the discretion of the driver to decide, another of the rights they have earned through payment of road tax. Contraflows differ from off road facilities however in that they will also always have a white line marking their boundary against the oncoming traffic (NB. There are some circumstances where they don't have the white line. These can often be easily identified by the lack of a white line). The line is there to provide protection from the oncoming traffic as no motorised vehicles are allowed to enter this lane by law and as a result none will dare. Contraflows are lanes for cyclists allowing access the wrong way up one way streets in situations where the street is wide enough to be safe for bikes to travel the opposite direction from the cars, free from the danger of needing to be directly in the path of oncoming traffic, such as this one here pictured on St Marks Road in Easton. In areas where there isn't enough space for a contraflow they simply aren't installed. There are strict rules and regulations in place to ensure that no cycle facilities are installed that may encourage cyclists into danger or confrontation. Good to know for your peace of mind. Note the presence of the bike shaped symbol once again. Another example can be found here on Cobden Street in Redfield. As is clear once again the lane is marked with a solid continuous white lane indicating a lane that oncoming vehicles will not enter. These lines are not only important for safety but also to let the vehicle drivers coming towards you know that you are allowed to be cycling the wrong way up a one way street. As a result the driver of a grey van will not hurl abuse at you for " going the wrong way you cyclist c*%& " as he hurtles round the corner from Morley Street as he'll be able to clearly see the markings as he turns the corner illustrated in the picture below taken from his perspective. Ignore the way it looks like the road is worn in a long curve towards the contraflow. This is not likely to be caused by drivers cornering at speeds in excess of the 20mph zone and most likely to be a result of the road camber and increasingly hot rains caused by global warming from excessive production of cycle helmets and the dyes used in hi-viz clothing. As with all practical exercises its also important to have a grasp of road theory too, so we'll leave you with one last mathematical exercise. If you're cycling south on a contraflow at 10mph and a grey van is travelling north at 40mph, what time is lunch in A&E? So there you have it. Know where you're meant to cycle, or more importantly where you're not, and you're all set to start enjoying the refreshing and delightful experience of cycling around Bristol. Join us next time for handy hints how to lock your bike outside Spike Island without accidentaly locking up someone elses bike too that happens to be sharing the same stand, so they don't have to spend an hour walking around the building asking if anyone owns a silver Dawes Hybrid. The Pavement is So Hot Right Now!